What’s the best approach for handling account manager vehicles? Three pros weigh in. The account manager vehicle policy at Toledo Lawns in Toledo, Ohio, has been flexible throughout the years. At one time some account managers drove company vehicles, while others were more comfortable driving their own. But after one of Joshua Way’s account managers was involved in an accident while driving a company-owned vehicle, he thought it might be a good time to reevaluate. Landscape company owners know their fleets are one of their most important—and most costly—investments. When deciding how to manage it, several factors must be considered. Three contractors discuss how they do it and why the method works for them. After the accident, Way decided it was a good idea to look for ways to limit his liability when it came to his fleet. This year, Way gave his two account managers the option of driving company vehicles or being reimbursed for driving their personal vehicles. Both chose to drive their own trucks, and the company reimburses them up to $500 per month for use of their personal vehicle. The reimbursement is intended to cover mileage, wear and tear and monthly payments. Fuel is provided by the company’s on-site fueling stations, and the employees are provided removable magnetic logos to place on their trucks during work hours. Way has 13 Chevy Silverado 2500s used by his labor crews, and he says knowing all his vehicles are locked up safely on company property at the end of the work day gives him peace of mind that he didn’t have before. Having all vehicles he owns on company property each morning is also more convenient if an employee calls off sick or can’t come to work that day. Antonio Zeppa, owner of Zeppa’s Landscaping Service in Crestwood, Ky., provides vehicles for his three account managers during work hours. They are used for purposes such as client visits, quality checks and estimating. The vehicles include a car, a truck and an SUV, and each dons a company logo. Although Zeppa’s Landscaping Service has an on-site fueling station, employees are provided a company credit card to fuel up on the road, if necessary. Zeppa has considered letting managers take the company vehicles home at the end of the day to maximize their time in the field, but right now, they are not permitted to do so. 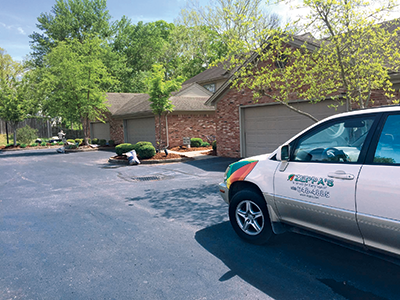 “Taking vehicles home is something we would consider, especially for employees who have been with us for a while, but it’s not something we have built in right now,” says Zeppa, whose $1.5-million company provides 80 percent maintenance and 20 percent installation services to an 80 percent residential, 20 percent commercial clientele. One factor that prevents Zeppa from allowing his employees to take their company vehicles home is the extra wear and tear. For example, a past account manager commuted an hour to and from work every day—a distance Zeppa thought would put excessive mileage on a company-owned truck. Another consideration is the uncertainty of not knowing where his trucks are or what they’re being used for after hours. Although the vehicles are equipped with GPS systems that track their routes, Zeppa says a certain level of trust is required for him to be comfortable placing his vehicles in someone else’s hands outside of the work day. 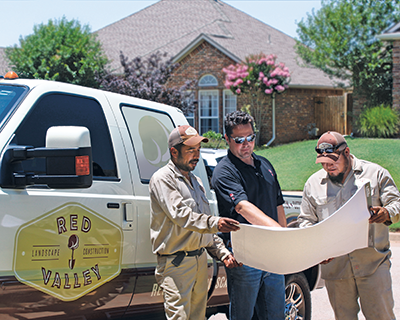 Mike Freeman, owner of Red Valley Landscape & Construction in Edmond, Okla., provides company vehicles to his five account managers and supervisors. They are permitted to take the vehicles home at the end of the day with the understanding that they are not for personal use. To Freeman, allowing his crews to take the vehicles home is beneficial from a marketing and branding standpoint because it gives the company name more exposure. He also believes it’s a better use of employees’ time during the workday. Freeman’s account managers and supervisors are also required to wash the vehicles weekly and stay on top of routine maintenance, like oil changes and tire rotations. These tasks, which are paid for with a company credit card, are to be completed after hours or on the weekends. Freeman chooses Ford F-250s that are fully wrapped with the company logo and imagery. Because many other landscapers in his area choose Chevy trucks, Freeman says his trucks stand out from the competition. The company’s on-site fueling station helps Freeman keep a close eye on fueling expenses and prevents his guys from having to stop for gas “and coffee and a donut” every morning. Since installing the stations in late 2016, he projects the company will save $3,000-$4,000 per year in labor costs and has seen increased productivity on the job site. While the right way to manage a account manager vehicle fleet differs from company to company, one thing remains constant, Freeman says. For any vehicle policy to work, the contractor must be able to trust his or her employees.